Shanghai Disneyland propose de nouveaux passes saisonniers valables la plus part des jours jusqu'au 25 janvier 2018, soit valables uniquement les jours de semaine, soit valables uniquement les dimanches. Ces passes procurent également différents avantages parmi lesquels une réduction de 20% dans les restaurants et les boutiques du resort et une réduction de 10 % sur les tarifs des chambres dans les deux hôtels du resort. La vente de ces passes pour les saisons d'automne et d'hiver débutera le dimanche 3 septembre. To celebrate the most festive season of the year, Shanghai Disney Resort today announced the launch of a new Shanghai Disneyland Fall and Winter Seasonal Pass, on sale beginning September 3. The new Fall and Winter Seasonal Pass offers a tremendous value for guests by giving them the opportunity to experience the magic of Shanghai Disneyland and invites guests to celebrate the holiday seasons like never before. During the holidays, Disney magic is coupled with unique festival moments guests can only find at Shanghai Disney Resort. The park will be transformed for many exciting holidays, including Halloween and Christmas, with tailored festive decorations, enchanting entertainment, holiday-themed celebration, special experiences and new offerings throughout the season. The Shanghai Disneyland 2017 Fall and Winter Seasonal Pass will be available for guests to purchase beginning September 3. The new pass will be valid for multiple entries by the same guest from September 3, 2017 to January 25, 2018. 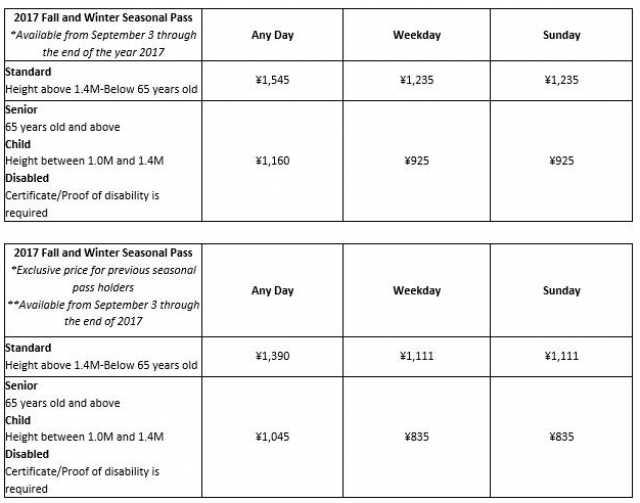 Standard, Child, Senior and Disabled passes are available at three tiers – Weekday, which is valid for admission on weekdays, except for holidays that fall on a weekday; Any Day, which covers all days except October 2 to 7 and December 31, 2017; and Sunday, which covers Sundays except December 31, 2017. Previous seasonal pass holders can enjoy special pricing when purchasing their passes. From September 3 to 10, the new Shanghai Disneyland Fall and Winter Seasonal Pass will only be available on the official Shanghai Disney Resort Fliggy Flagship Store with limited-time launch offers for new passholders, in celebration of the resort’s Tmall Heybox special promotion. From September 11 through the end of 2017, the pass will be available on multiple official channels at marquee prices – including the official Shanghai Disney Resort Fliggy Flagship Store, the resort’s official WeChat and QQ accounts, the Shanghai Disney Resort Reservation Center, the Shanghai Disneyland Main Entrance ticket booths, the resort’s official store on JD.com and through the resort’s official travel trade providers, Ctrip and Dianping. The new Fall and Winter Seasonal Pass will continue to provide guests with a wide array of exclusive benefits including special offers for resort hotels, discounts on dining and merchandise, Disneytown special offers and many more. Additionally, passholders have special access to exclusive events just for them. Guests are invited to visit the Shanghai Disney Resort official website www.shanghaidisneyresort.com for more detailed information. Shanghai Disney Resort - 25 août 2017. When can guests purchase their 2017 Fall and Winter Seasonal Pass? The Shanghai Disneyland 2017 Fall and Winter Seasonal Pass will be available for guests to purchase beginning September 3. Previous seasonal pass holders can enjoy special pricing when purchasing their passes. From September 3 to 10, the new Shanghai Disneyland Fall and Winter Seasonal Pass will only be available on the official Shanghai Disney Resort Fliggy Flagship Store with limited-time special launch offers, in celebration of the resort’s Tmall Heybox Promotion. What is the price of the pass? We offer Any Day, Weekday and Sunday passes. Passes for children, seniors and disabled guests will also be available for purchase at reduced prices. Limited-time special offers will be available for new passholders at Shanghai Disney Resort’s official Fliggy Flagship store from September 3 through September 10 to celebrate the resort’s Tmall Heybox Promotion. Previous 2016 Winter Seasonal Pass holders and 2017 Spring Seasonal Pass holders can enjoy special prices when purchasing their passes. Complete charts with all pricing are below. What does the Fall and Winter Seasonal Pass include? The Shanghai Disneyland 2017 Fall and Winter Seasonal Pass will be available for guests to purchase beginning September 3. The new pass will be valid for multiple entries by the same guest on most days from September 3, 2017 to January 25, 2018. 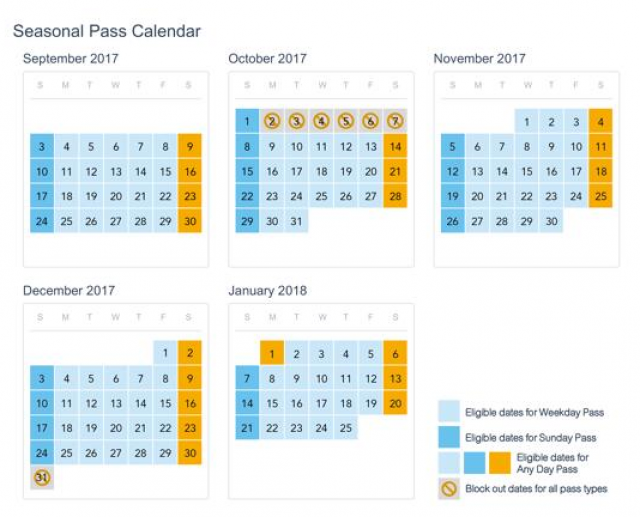 Standard, Child, Senior and Disabled passes are available at three tiers – Weekday, which is valid for admission on weekdays, except for holidays that fall on a weekday; Any Day, which covers all days except October 2 to 7 and December 31, 2017; and Sunday, which covers Sundays except December 31, 2017. *Please visit the Shanghai Disney Resort official website for the full list of the special benefits and users Terms & Conditions. Is a government ID required to purchase the seasonal pass? Yes, government ID is required at the time of purchase. However, the guest who purchases the seasonal pass does not have to be seasonal pass holder or user. The seasonal pass will be associated with the identity and photo of its user on the first visit and is non-transferrable after that. A Guest can only own one Fall and Winter Seasonal Pass in his/her name. How do guests receive their seasonal pass? Guests who have purchased a seasonal pass are encouraged to visit the official channel where they purchased their pass and make an advance reservation to activate the pass at one of our ticket booths. Guests will have their photo taken and have their pass issued at that time. Guests will use the same ticket from their first visit for subsequent visits and their photo on file will be used for validation. After January 25, 2018, all Shanghai Disneyland 2017 Fall and Winter Seasonal Passes expire and are no longer valid for entry. What are the restrictions on the seasonal pass? The Shanghai Disneyland 2017 Fall and Winter Seasonal Pass will be available for guests to purchase beginning September 3. The new pass will be valid for multiple entries by the same guest most days from September 3, 2017 to January 25, 2018. Standard, Child, Senior and Disabled passes are available at three tiers – Weekday, which is valid for admission on weekdays, except for holidays that fall on a weekday; Any Day, which covers all days except October 2 to 7 and December 31, 2017; and Sunday, which covers Sundays except December 31, 2017. Admission is subject to available park capacity each day. THE LION KING production at the Walt Disney Grand Theatre at Disneytown, Shanghai Disney Resort’s shopping, dining and entertainment area, is a separately ticketed event and is not included as part of the seasonal pass. The pass does not include free access to the Shanghai Disney Resort parking lots. Can guests change the name on their seasonal pass? How can guests get answers to any additional questions they might have? Guests can contact the Shanghai Disney Resort Reservation Center at 400-180-0000 or 86-21-31580000. Ben je ne peux pas vous dire, je n'y suis jamais allée. Shanghai Disney Resort introduira cet automne des Fastpass Tickets au format digital pour les sept attractions du Parc participant au programme. Ces Fastpass tickets au format digital seront accessibles par l'intermédiaire d'une application sans coût supplémentaire. Une fois dans le Parc, les visiteurs pourront ainsi réserver et gérer tout au long de la journée leurs Fastpass à partir de leur smartphone sans devoir faire la file aux bornes automatiques. Le service payant Disney Premier Access sera lui aussi disponible via l'application officielle. Pour les visiteurs réfractaires ou n'ayant pas accès à l'application, des Fatspass tickets au format papier seront toujours distribués aux bornes automatiques situées dans les différents lands du Parc. Image : Shanghai Disney Resort. Guests who want to enjoy faster access to their preferred attractions will no longer need to stand in queues to obtain Disney Fastpass tickets. Shanghai Disney Resort today announced that its popular Disney Fastpass service will be transformed into a digital system, enabling the convenience of booking and redeeming Disney Fastpass on mobile devices from anywhere within the theme park, at no additional cost. 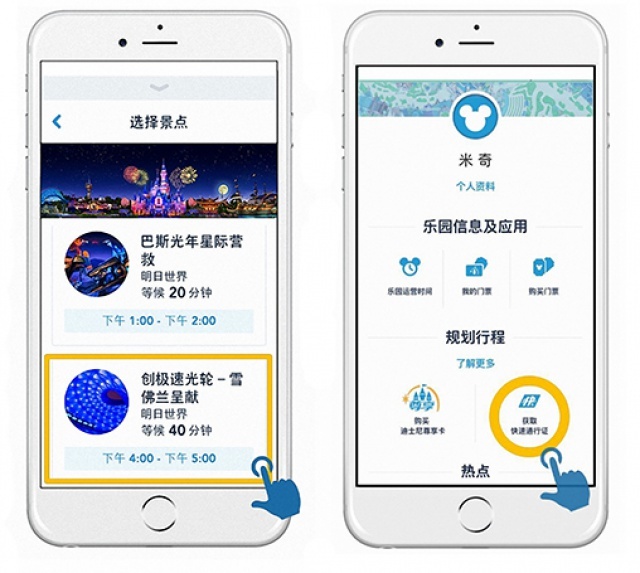 After the introduction of the digital platform in this fall, guests visiting Shanghai Disneyland are encouraged to download the resort’s latest version of the official app, through which they will be able to reserve digital Disney Fastpass tickets for participating attractions on their mobile phones from anywhere within the theme park. Disney Fastpass has been enjoyed by millions of guests visiting Shanghai Disneyland in the past year, allowing guests to better plan their visit to the theme park. Starting this fall, guests will continue to enjoy the Disney Fastpass service at no additional cost but in a more efficient and flexible way. Instead of hurrying to designated Guest Services locations, guests will soon be able to obtain a digital Disney Fastpass ticket through the official Shanghai Disney Resort app. After entering the theme park, guests can associate their activated ticket with the app, and then follow the instructions to view, select and reserve a digital Disney Fastpass, as well as check the designated return time. Once at the Disney Fastpass entrance of their selected attraction, guests can simply present the QR code on their device or park ticket for scanning. After the validation of the Fastpass as well as the photo identification associated with guests’ park ticket, guests will then be able to enjoy the faster access to the fun. Along with the digitalization of Disney Fastpass, Disney Premier Access, launched earlier this year, will also be available for purchase through the app from anywhere within the park, while supplies last each day. Disney Premier Access allows guests to enjoy faster access to participating attractions anytime during their visit. Since the opening of the first Disney theme park in 1955, Walt Disney Parks and Resorts has pushed the boundaries of creativity and innovation to deliver a world-class guest experience for everyone, using technology in a smart, seamless and magical way to enable the next level of storytelling. 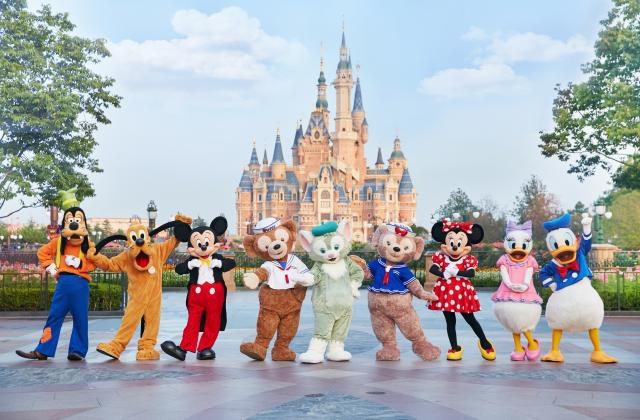 Disney Fastpass has been enjoyed by millions of guests visiting Disney parks around the world each year and continues to evolve at each of our destinations, including Shanghai Disney Resort. While each Disney destination provides different Fastpass options based on how guests enjoy their visit, those options stay true to the core principle of improving the guest experience, allowing guests to get to the fun faster. Guests will continue to have the option of obtaining a Disney Fastpass ticket at Fastpass kiosks located in each land’s Guest Services, just as they do today. After scanning their park ticket at the Fastpass kiosk, their park ticket will automatically be linked with a digital Disney Fastpass to their selected attraction. At the Fastpass entrance of their selected attraction, guests can scan their park ticket to enjoy faster access. Disney Fastpass and Disney Premier Access tickets are subject to availability and non-transferable. All Disney Fastpass and Disney Premier Access tickets will be date-specific and valid for admission for one person, one time only on the date obtained or purchased. All tickets are subject to the operating schedule of attractions. Guests can visit the official Shanghai Disney Resort website or check the official mobile app for the latest information. Shanghai Disneyland Resort - 7 septembre 2017.
ou ceux ne sachant pas lire le chinois ? Très bonne idée pour lutter contre la fraude ! Par contre, va falloir très réactif pour chopper les Fastpass du coup. Et niveau réfractaires, ils seront pas nombreux. Je suis à Shanghai pour le travail fin octobre et je passe 2 WE sur place, je vais essayer de faire un tour à Disneyland je ne suis qu'à 20 minutes du parc! comment ça se passe les VIP fastpass là-bas? c'est à quel prix? et c'est illimité comme en France ou on a le droit à seulement x attractions? Je suppose que tu fais référence au service Disney Premier Access qui permet d'utiliser l'entrée réservée aux Fasspass tickets pour accéder à l'attraction. Le prix est de 120 yuan (+/- 16 euros) en basse saison / 150 yuan (+/- 20 euros) en haute saison pour un accès prioritaire à une attraction (un passage unique) et 480 yuan (+/- 65 euros) en basse saison / 600 yuan (+/- 80 euros) en haute saison pour un set complet (un passage unique à chacune des sept attractions du programme). Les attractions qui proposent des Fastpass tickets (service gratuit) et l'accès prioritaire Disney Premier Access (service payant) sont : Soaring Over the Horizon et Roaring Rapids à Adventure Isle; TRON Lightcycle Power Run et Buzz Lightyear Planet Rescue à Tomorrowland; Seven Dwarfs Mine Train, The Many Adventures of Winnie the Pooh et Peter Pan’s Flight à Fantasyland. Et on peut acheter le premium acces à n'importe quelle heure? Si jamais, les deux dernières fois que j'ai demandé la fille Single Rider pour Roaring rapids, elle n'était pas ouverte. Possible qu'il ne l'ouvre que les jours de forte affluence. Les vacances de la fête nationale étant terminées, t'auras peu de monde en semaine, mais je peux pas te dire le week-end (j'y suis jamais allé à ce moment-là). J'y suis allé lundi dernier (le lendemain de la fin des vacances), c'est la fois où j'ai eu le plus de monde, mais j'ai réussi à faire toutes les attractions majeures entre 9 h et 17 h, sachant que le parc fermait à 20 h 30. En gros, j'ai utilisé trois fast pass (Soarin', Winnie et Peter Pan) et fait des queues qui allait de 5 à 40 minutes (et une de 60 minutes pour le trail qui a eu un problème je crois). Et oui, en effet, y aller pendant la Golden Week, c'est l'horreur ! Je reviens du parc, j'ai adoré! Il y avait beaucoup beaucoup beaucoup de monde pour les files d'attraction mais personne en boutique et restau (il faut dire que comparé aux prix hors parc, c'est facilement 2 à 3 fois plus cher). Le Chateau fait massif sur les photos mais en vrai je trouve qu'il fait bien et le jardin devant c'est une vrai bonne idée, il est en pente et 'cloisonné' ça permet une bonne visibilité même bien derrière. Merci pour ton retour et sur les autres rides ton avis sur ,Soarin ,Tron , Buzz,Peter Pan ,le coaster des 7 nains et le show nocturne . Merci à Toi . * Tron: fait en fastpass. File normale 105 minutes, FP 15 minutes. J'ai attendu qu'il fasse nuit pour le faire car il y a une partir outdoor et je ne voulais pas être ébouie et profiter des lumières noctures.C'est génialissime car on a pas l'habitude d'être dans une telle positions dans un coaster. Le décompte du début te met bien la pression Une accélération de ouf et c'est parti!!!! De super sensations, j'ai trouvé la longueur acceptable (même si un poil plus aurait été mieux mais pas de frustration) et une seule envie en sortant: y retourner! * Soarin: fait en fast pass. File normale 150 minutes, passé en 30 minutes. File d'attente juste horrible car entre 2 murs sans déco du "temple". Mais la voute étoilée est jolie... Le ride, c'est la première fois que je faisais un Saorin et j'avoue que j'ai beaucoup aimé, on a vraiment l'impression de voler. La durée est bonne. * Grotto del crystal. Une ballade en bateau très chouette avec des scènes de dessins animés en musique et en fontaine. Fait de jour. Ce ride mérite 4 passages: Coté gauche et côté droit de jour et pareil de nuit. Je n'ai malheureusement pas eu le temps de le refaire de nuit. 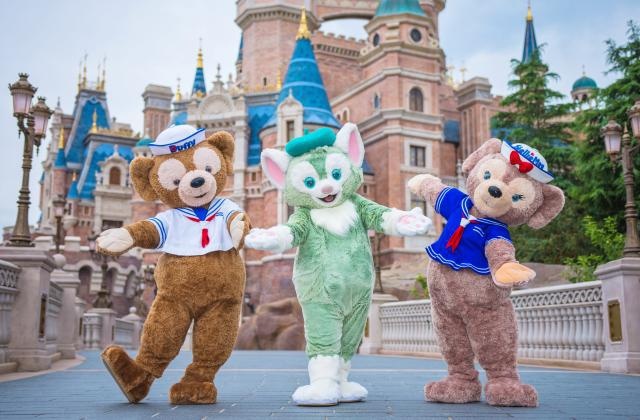 Après Tokyo Disneyland et Hong Kong Disneyland, Gelatoni arrive à Shanghai Disneyland où il rejoint Duffy et ShellieMay déjà présents ! Crédit Photographique : Shanghai Disney Resort. 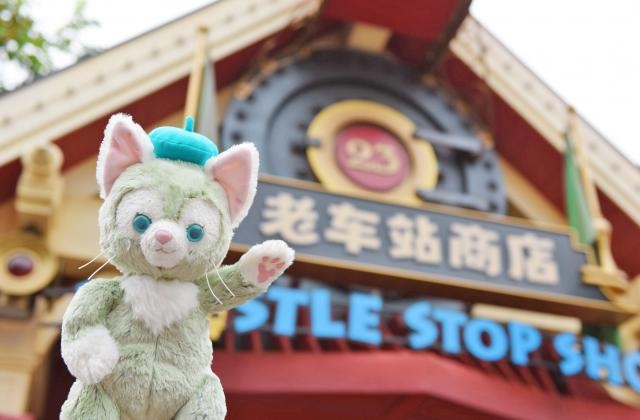 Shanghai Disney Resort is celebrating the arrival of Gelatoni – the adorable feline friend of Duffy Bear cherished by Disney fans around the world. 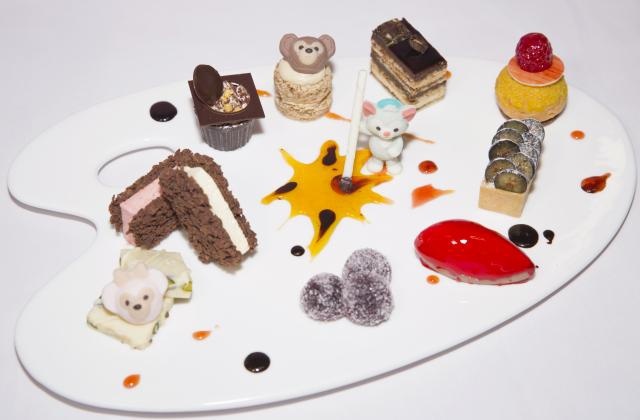 Mickey, Minnie, Duffy, ShellieMay and other Disney friends welcomed Gelatoni to Shanghai Disney Resort, which also launched a new line of merchandise, as well as food and beverage offerings featuring Gelatoni. As most fans of Walt Disney Parks and Resorts already know, Duffy is a Disney bear designed by Minnie Mouse to accompany Mickey while he travels the world. 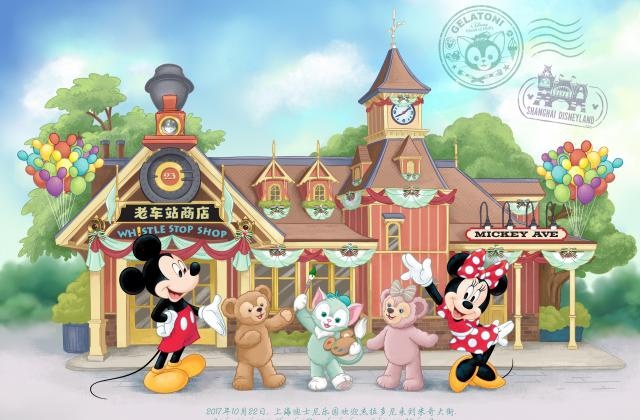 As a present for Duffy, Minnie Mouse also designed a pink Disney bear named ShellieMay, who joined Duffy and began her journey at Shanghai Disney Resort earlier this year. 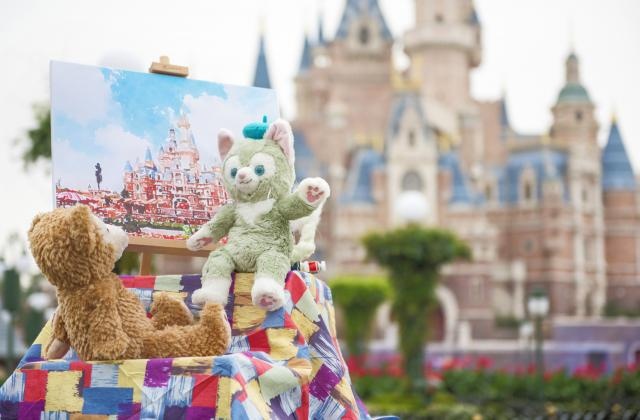 Gelatoni, a boy cat with bright eyes, a long tail, and a beret who loves to paint, is the latest arrival of Duffy’s friends at Shanghai Disney Resort. 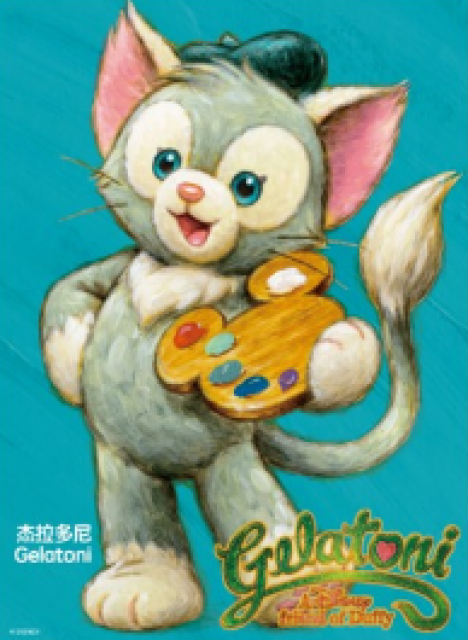 He uses his tail as a brush to paint scenes of his adventures, his friends and even his namesake – gelato (Italian ice cream). 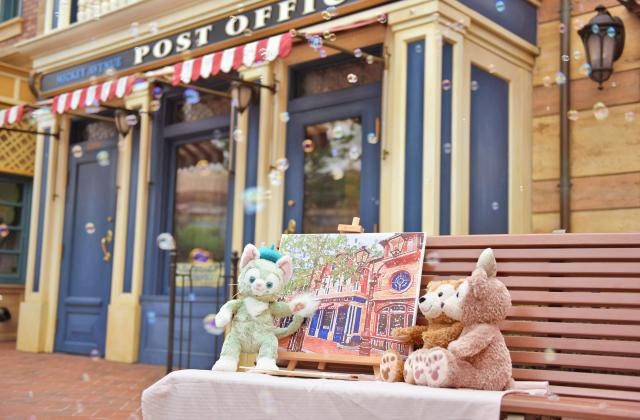 Gelatoni met Duffy and Mickey Mouse along the Palazzo Canals and quickly became friends, after Duffy spilled his gelato and Gelatoni saved the day by using the spilled dessert to paint Duffy a picture on his canvas. 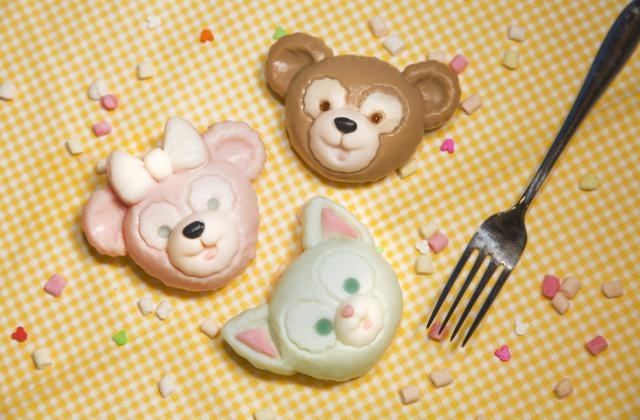 Duffy learned the fun of painting from Gelatoni and the two friends exchanged each other’s favorite work of art as gifts. 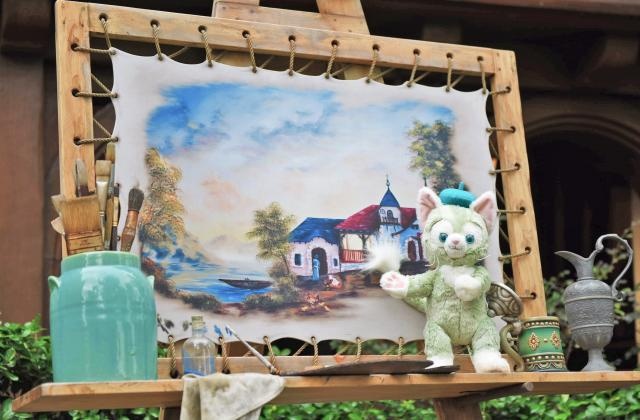 This curious Italian kitten will paint, explore, smile, and bring even more magic, cheer and happiness to guests at Shanghai Disney Resort. 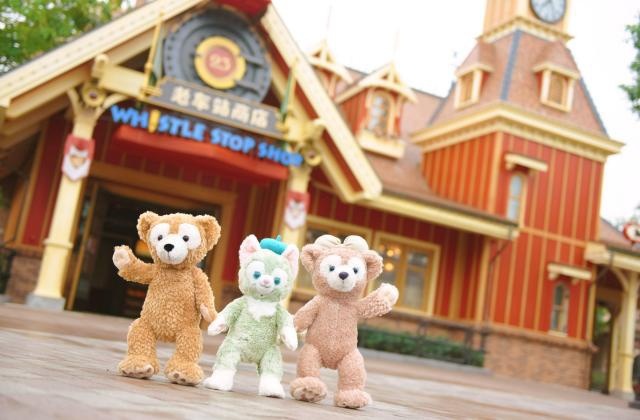 Following the releases of the popular Duffy Bear and ShellieMay collections, Shanghai Disney Resort is introducing a new line of Gelatoni merchandise and a vast array of new collectable items. Guests will find their favorite Gelatoni merchandise throughout Whistle Stop Shop on Mickey Avenue – which is being transformed to celebrate Gelatoni’s arrival. 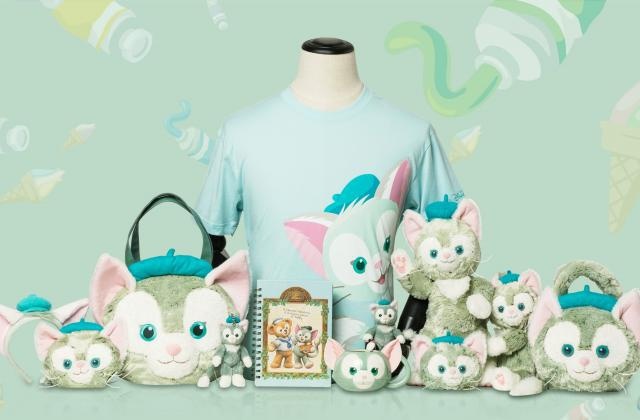 The brand new Gelatoni collection features a wide range of collectable items including home décor, souvenirs, headwear, stationery, accessories and pins. 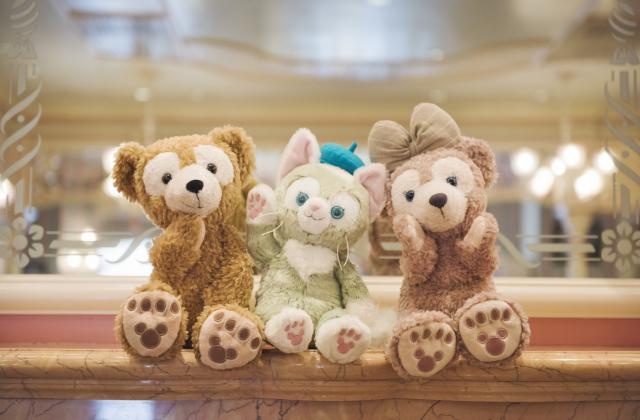 The newest plush offerings will be hugely popular with fans, including the adorable backpacks, wrist bags and cross-body bags, along with classic plush, all of which feature Gelatoni’s iconic beret, cute perky ears, whiskers and bright eyes. 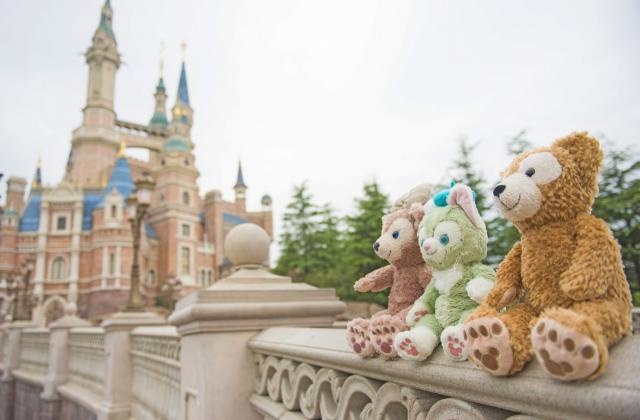 Guests should definitely not miss out on Shanghai Disney Resort’s exclusive offerings including the ‘eared’ headband, t-shirts with cute Gelatoni poses, and new pins. These exclusive new products incorporate Shanghai Disney Resort elements making them one-of-a-kind finds for Disney fans in Shanghai and across the world. 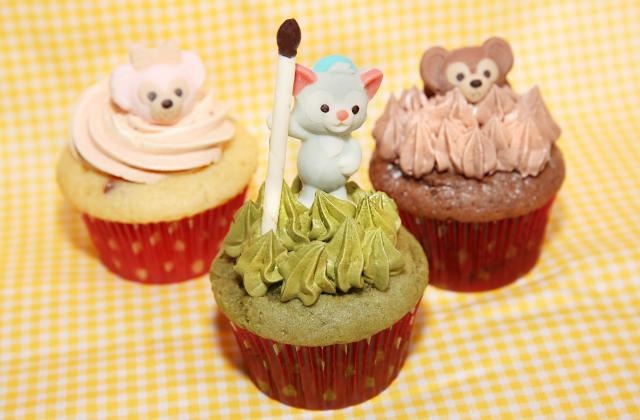 As part of the arrival celebration, guests will also find Duffy, ShellieMay and Gelatoni-themed food and beverage offerings, including panna cotta, cupcakes and ice cream cones at Mickey and Pals Market Café, Remy’s Patisserie and Il Paperino. Shanghai Disney Resort - 22 octobre 2017. A ce que j'ai pu lire, c'est pareil pour le wifi des centres commerciaux, hôtels et restaurants. J'ai pas eu de soucis a utiliser le wifi a Shanghai Disneyland avec mon telephone canadien la semaine derniere. J'ai choisit l'option internationale, mit mon code de pays (1) puis mon numero de 10 chiffres. J'ai recu le code par SMS en 10 secondes et j'etais connecte toute la journee. Les fast pass par l'application etait geniale, meme si le parc avait pas vraiment de grosse foule. On a attendu le matin 30 minutes pour Soaring over the Horizons et j'ai reserve durant ce temps la Peter Pan. Rendu 5 heures le soir, Tron et la Mine des Septs Nains n'avait plus d'attente. J'ai finit la soiree sur Tron, qui est mon coup de coeur. Ma deception? Soaring et a un certain niveau, Voyage to the Crystal Grotto. Bon ben ça doit être aléatoire selon ton provider car même le cast de l'accueil qui avait l'air de maîtriser parfaitement le truc vue la vitesse où il fouillait les options n'a rien pu faire pour mon téléphone. Mais bon c'est un détail pour les cartes wifi elles sont proposées directement dans l'aéroport à côté du baggage claim si besoin. Perso je ne voulais pas changer ma carte car je dois pouvoir être jointe pour mon boulot tout le temps et c'était trop de boulot de prévenir tout le monde. La flemme quoi. Et même l'option de 4g internationale réservée de France ne veut pas marcher. .. je ne dois pas avoir la main "numérique".